Learn more about foundation partnerships with CSUSM. Contact Lauren Tucker in University Advancement at 760-750-7313. 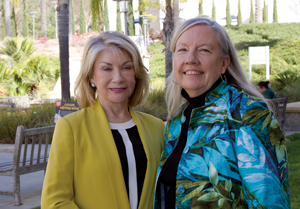 Ruth Westreich (left), president and founder of the Westreich Foundation, and Helen McNeal, executive director of the California State University Institute for Palliative Care, located at Cal State San Marcos. Ruth Westreich, president and founder of the Westreich Foundation, is a passionate advocate for integrative medicine, a growing field that combines conventional medicine with the best of evidence-based complementary medicine to provide care to the whole person-mind, body and spirit. "I never could understand the approach to medicine that just looks at the one ailing body part and seeks to fix only that one thing," she said. "The whole body is an interconnected system and I believe that the best quality of care also takes into account the psychological, social and spiritual aspects of healing." As an artist, author and designer, Westreich understands the healing power that art and music can play in restoring wellness or improving quality of life, even when a cure is no longer possible. And now through a generous $170,000 gift to the California State University Institute for Palliative Care, located at Cal State San Marcos, she is helping to enhance healing and improve quality of life for more individuals and their families. "By 2020, 55 million Baby Boomers will be living with one or more chronic conditions in the United States," said Westreich. "And as the population ages, people are living longer-often with debilitating pain and other symptoms. Palliative care strives to ensure quality of life for all individuals with serious or chronic illness, no matter the circumstances." A portion of Westreich's gift supported the development of in-person and online "Healing through the Arts" training workshops. At these workshops participants learn how to help their patients express themselves through art, enabling them to release painful or unresolved emotions caused by difficult life events, such as the death of a loved one, divorce, trauma or illness. "Healing through art is different from art therapy because it doesn't require the assistance of a licensed therapist," she said. "The healing takes place through the process itself of self-expression and doing something creative-painting, journaling, collaging or drawing. It's healing by doing." With Westreich's support, the Institute also launched an in-person and self-directed online aromatherapy course. Essential oils used in aromatherapy can decrease anxiety, promote relaxation, reduce nausea and lower physical discomfort in patients with chronic pain and/or debilitating injuries. "Ruth's generous gift is enabling the Institute to play an increasingly significant role in developing new programs, training new students and expanding access to integrative medicine expertise within the world of palliative care," said CSU Institute for Palliative Care Director Helen McNeal. "Ruth is a wonderful partner, and we appreciate her spirit of partnership and collaboration."